The Deluxe Package includes the Prime 300 long term hospital bed system and an advanced hospital grade alternating pressure mattress system. The alternating pressure mattress system is designed for prevention and will heal up to a stage 4 bedsore. The digital pump has a 10 zone comfort control and has adjustable cycle times pain management and advanced healing. You are looking for stage 1-4 bedsore healing and prevention. If you experience sweating or heat and moisture on the skin. If you need a product that remains inflated in the event of power failure. 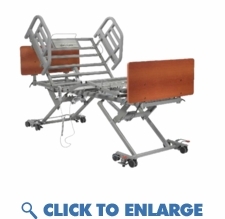 If you are looking for a air mattress used in hospitals or nursing homes. If you are looking for the most balanced hospital air mattress for prevention - advanced healing.